After my good ol' trusted PST died (was able to break the pliers) I had to get a new Leatherman and it was very easy to choose which one. Because I'm always tinkering with stuff I needed a multitool with bit set and Charge ALX is the only multitool with 3 replacable bits. One thing I really like ALX is the seat belt/gutting hook on the serrated blade. It also works excellently in opening boxes or shrink-wrapped products. The bit kit holds them pretty tight as do the multitool itself. Never worried about losing the bits and so far haven't lost one. On the other hand, I have 1 3 bit kits so losing one wouldn't be the end of the world... And you can get a completely new kit pretty cheaply on ebay. So do you worry about losing the bits ever? This is amazing tool but it's not perfect. Initially I had Leatherman Charge Ti but it was impossible to open the serrated blade with one hand so I returned it, but I had to take Charge AL instead of Ti, cause Ti was discontinued (I wasn't very happy about that as obviously titanium is more expensive than aluminum and I paid for titanium, but what could I do).The pliers are not closing perfectly, there is a small gap between them, but when I checked few others they had similar or bigger gaps. Also I had left the tool few weeks in the drawer and after that I spotted some rust on several places. Tool wasn't even used before I left it there. I understand that it's made of higher carbon steel to make the pliers harder, but you can imagine how "easy" is it to get rid of the rust spots on such complicated tool. I paid about 160 euros for it in Europe. I think it's much better value in US than in Europe. 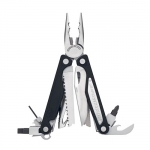 The Leatherman Charge is an outstanding tool. It is of particular use due to its ability to shift different bits. This brings the capacity to use this tool for all sorts of applications. 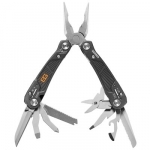 I have had a wide variety of leatherman type tools, including other Leathermans and Gerbers, and believe this is an exceptional product. I particularly like the knife blade with its 154 CM steel. This steel is awesome and is the same steel I use in my coveted Benchmade knife. I had this item one day and then returned it. When I received it the pliers were not closing right. The tools felt weak and too small for what I use my multitool for and the tool overall felt too small for heavy duty use. After 2 hours of using it the pliers were extremely difficult to open because they became jammed closed, I had broken the saw in half and the broken part flew off and cut me. I know I am different from the majority of people when it comes to my opinion of this tool but this review is just my opinion.